One of my distinct childhood memories is of the occasional cocktail parties my parents gave. They didn’t happen often, but when they did, my sister Julie and I would help make the house sparkle and set up the appetizer table in the family room, knowing our reward was nigh. Of course, Julie and I could not have cared less who was coming over, and once we survived the polite introductions, our work was done. Those nights were an occasion because we were promised a rare and exotic frozen TV dinner, eaten in front of the TV. Anything to keep us occupied and out of the way. We were in heaven. Party nights were also special for the other uncommon foods in the house. Bags of potato chips with sour cream dip (my sister and I tempting each other with the old ad pitch “Bet you can’t eat just one!” ); tiny sweet gherkins; pitted black olives whose main appeal was as freaky finger coverings; cocktail weenies on toothpicks; and of course my dad’s shrimp cocktail. “Dad’s Shrimp,” as it came to be known, was a fairly grownup flavor for little kids, but I loved it: unexpectedly piquant, spicy and barely sweet. The recipe came from a long-ago edition of Sunset magazine, and who knows how close Dad’s version is to the original. I’ve never known him to follow any recipe from start to finish. He might use one for inspiration and to understand the intended flavors, but then he adds a dollop of creative license to make it his own. And the theater involved — well, it’s amusing to watch. When he’s really having fun, he talks to himself while he bobs and jigs around the kitchen: “A little of this, and, ah, a little of that … yes. That’s it. Oh, do you know what would be good? I know just the thing.” Though I was not present when he first made this shrimp cocktail, I imagine that’s how it went down. And several years ago when I asked him for the recipe, it was clear that the science of measurement was not something he’d applied to this dish — ever. Its components seem odd. And when I list the ingredients to curious friends, they respond surprised: “Really? Ketchup? Mustard? Celery?” Yes, really. Good, isn’t it? I still crave it. 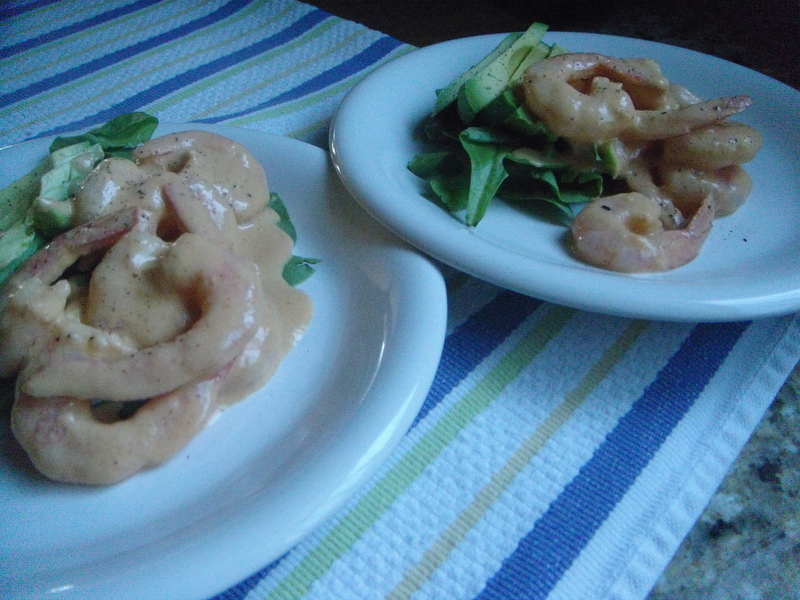 That snap of horseradish and tarragon vinegar lend a zesty contrast against chilled poached shrimp and creamy avocado. Here is the recipe as told by my dad. Mine never quite tastes the same as his, so the liberties he takes with measurements are not perfectly represented here, and every measurement could be followed by an “-ish.” But like a good ’70s cocktail party, it’s still groovy in my book. Pour over 1 1/2 pounds poached shrimp (shelled and deveined) and refrigerate for 2 to 3 hours. Serve over avocado slices on individual plates or small bowls. I like making a bed of arugula or spinach under the avocado. It never lasts for days in our house. More like hours at best! Still a favorite! thanks for the reminder. I can almost taste it, yum! Something is different, the sauce I remember was tomato red. I think it may have evolved over time, perhaps? Or maybe with each iteration.